Life couldn't be better…until Andrew begins to pick up on the fact that (1) every Away Mission involves some kind of lethal confrontation with alien forces, (2) the ship's captain, its chief science officer, and the handsome Lieutenant Kerensky always survive these confrontations, and (3) at least one low-ranked crew member is, sadly, always killed. Not surprisingly, a great deal of energy below decks is expendedon avoiding, at all costs, being assigned to an Away Mission. Then Andrew stumbles on information that completely transforms his and his colleagues' understanding of what the starship Intrepid really is…and offers them a crazy, high-risk chance to save their own lives. Those poor security officers in the red shirts that seemed to die every time Kirk and Spock went on an away mission? This book is about them. On the surface, this is a spoof of those original Star Trek episodes, but as you read further you realize it is something more. Written with Scalzi's fantastic humor that kept me chuckling throughout, the story takes a rather interesting left turn that kept me coming back for more to find out exactly what is going on aboard the Universal Union ship Intrepid. Definitely recommended for fans of John Scalzi and science fiction in general. Good for quite a few laughs and yet deeper and more heartfelt than it seems at first. It's fun, it's experimental, it's meta, but like all great stories it's about growing as a human being. Any fan of the genre who is a student of life will love this book. Redshirts is a mockery of televised science fiction and also much more. Much more. A simple parody of the notorious "that-character-is wearing-a-red-shirt-so-you-know-he's gonna-die" trope/cliche/plot device from Star Trek would have not been particularly interesting if written by a less skilled author. (Anyone rolling their eyes toward the heavens imploring deliverance from such a story, as I did for months before reading it, rest assured, it is well worth reading.) 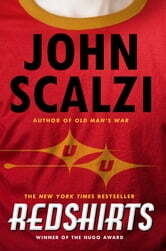 Mr. Scalzi lifts the premise beyond the usual pap one would expect to create a unique, well crafted story with flawless characterization and plotting. The story ends with three epilogues that resolve loose ends and allow the reader to feel the plight of the characters and feel their emotions at the close of the story. If you are a fan of Star Trek, then you should be familiar with red shirts and what invariably happens to them. They are usually the no name expendable members of the crew. They go on an away mission and meet the most unfortunate ends while the main cast comes out of it alive and well (sometimes against overwhelming odds). What would happen if these characters weren’t characters at all, but real people that are put in precarious situations because of script writers? Of course, the writers don’t know just how much their writing affects these real flesh and blood people so week after week they sacrifice countless people for the amusement of others. This is the premise of Scalzi’s book. At first this can sound a bit campy. My initial fear was that this would be exactly that (ok, maybe I kind of hoped it since I kind of like campy stuff). It starts with Dahl getting assigned to the Intrepid. Almost immediately he notices how weird the crew gets when the senior offices come around looking for people for away missions. Then there is the fact that to solve some of the issues that come up with space travel are solved without any actual science, almost like magic. Eventually Dahl meets a man who tells him what he thinks is going on. So, in order to save their own lives, Dahl and his friends go on their own trek to solve the mystery of the Intrepid. All in all, this was a delightful read. For me, it started out light and playful but became a bit heavier as I kept reading. I felt like someone who was hanging out with Timothy Leary and had a sudden revelation like “what if…” Then, I was all like, “Whoa, dude!” A few places dragged but thankfully those areas were few and far between. This was my first Scalzi book, but I definitely would pick up more of his offerings. If you are a fan of Star Trek, you should definitely check out this book.